New Delhi: In a seemingly abrupt turnaround, Prime Minister Manmohan Singh said that the government would not jeopardize the longevity of the United Progressive Alliance’s (UPA) term over differences with Left allies about the India-US civilian nuclear deal. While this appears to have opened the door wide for the Congress and the Left to bury their recent differences, or at least step back from the brink for now, the comments also triggered fears that the government would be willing to sacrifice a difficult-to-obtain nuclear deal. “If the deal does not come through, it will be a disappointment. But sometimes in life you have to live with them. 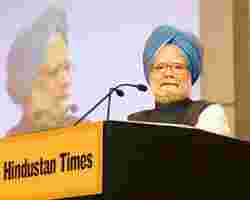 It is not the end of life," Singh said at the Hindustan Times Leadership Summit hosted by HT Media Ltd, which also publishes Mint. Other political parties were quick to react. Even as the Congress dismissed the Bharatiya Janata Party’s allegations of a U-turn, A.B. Bardhan, general secretary of the Communist Party of India, said: “The Prime Minister’s remarks come as a breath of sobriety, but they will be tested in our further discussions. Until Friday, it seemed as if the Congress wanted the deal at all cost—even the government falling. Now, we shall see on the 22nd, our next date for talks, or maybe even before that." Indeed, in answering questions from the audience at the summit, Singh defended the agreement and hoped it might yet happen. “What we have done with the US is an honourable deal," he said. “It is good for India, and good for the world. We are a coalition. We are trying to reconcile divergent views. I am hopeful that common sense would eventually prevail." The modalities of the deal require that the government finalize its negotiations with the International Atomic Energy Agency (IAEA) by December, to give the US Congress time until early next year to endorse the agreement. Failure to adhere to the deadline would mean that it would start going into the unpredictable political waters of a rapidly approaching presidential election. American voters will choose a successor to George W. Bush in November 2008. Speaking immediately after Singh, Congress party president Sonia Gandhi strongly reiterated the government’s resolve to last out the full term till 2009 and how it wants to use the remaining time to pursue its “unfinished agenda". A spokeswoman for the US embassy here declined to comment on the developments. “For the first time since the Congress upped the ante, it seems to have realized that it is not a one-party government. It has clearly blinked, hit the pause button and decided against an imminent election," said political analyst Mahesh Rangarajan. “It is not just the Left that the Congress has to contend with. This is the first time that the anxieties of the coalition partners within the UPA, whether it be Lalu Prasad, Sharad Pawar or M. Karunanidhi, seem to have hit home. But the credibility of the Congress is bound to be seriously dented." Business leaders present at the gathering approved of the government’s stance. “This does not mean that the deal is dead," said Sunil Bharti Mittal, chairman, Bharti Enterprises and president of the Confederation of Indian Industry, an industry lobby group. “All they have said is that they will have to work around the coalition. This also doesn’t mean that the government will come under increasing pressure from the Left parties. The Left won’t press the government on every issue either. In fact, as the Prime Minister made it clear, the government is going ahead with its critical agenda of education over the next 18 months." Amit Mitra, secretary general of the industry body Federation of Indian Chambers of Commerce and Industry, said even if the nuclear deal were to die, relations between India and the US wouldn’t suffer. “India and the US have excellent trade relations in all sectors," he insisted. “This (the nuclear deal) was just supposed to be an add-on." “I don’t think it will have any bearing (on foreign fund inflows)," maintained Tejpreet S. Chopra, CEO of General Electric Co.’s Indian operations. Diplomats from western countries present at the summit were, however, not so sanguine about the shift in stance. While they did not wish to be identified, they said that failure to clinch the civilian nuclear deal would be a foreign policy setback for India. In addition, they maintained that if the government failed to tie up the deal before the Bush administration left office, then there was no guarantee that the incoming regime would not seek a re-negotiation. Responding to a question, Singh also admitted that the government would, in light of the differences among the coalition, be “constrained" in its capacity to push big ticket reforms. However, finance minister P. Chidambaram, who also spoke later in the day, dismissed apprehensions of increasing compromises with the Left parties. “Why assume we will compromise?" he said. “I don’t share this pessimism that things will get more difficult for investors. There is no evidence for that." Chidambaram pointed out that the evidence only confirmed that the government had delivered 9% growth. “I expect to present the (next) budget," said Chidambaram. “It will be a budget that continues efforts we have made. There’s every reason to remain on course, we must remain on course." Separately, the finance minister also expressed some concerns about the sharp rise in the Bombay Stock Exchange’s benchmark Sensex. “The steep rise in the Sensex sometimes surprises me, sometimes worries me. Things will cool down after some time." After soaring in recent days, the Sensex fell 395.03 points, or 2.1%, to 18,419.04 on Friday. Pragya Singh contributed to this story.